According to a Feb. 23, 2018 Forbes report, “urgent care is becoming an increasingly popular form of healthcare delivery with even more players expected to enter the business.” The article cited figures from the Urgent Care Association of America showing growth in urgent care centers increasing nearly six percent consistently year over year for the past few years, and it’s expected to continue. I remember distinctly the day that changed the way I thought and changed my life’s mission into the direction I’ve taken over the past decade. 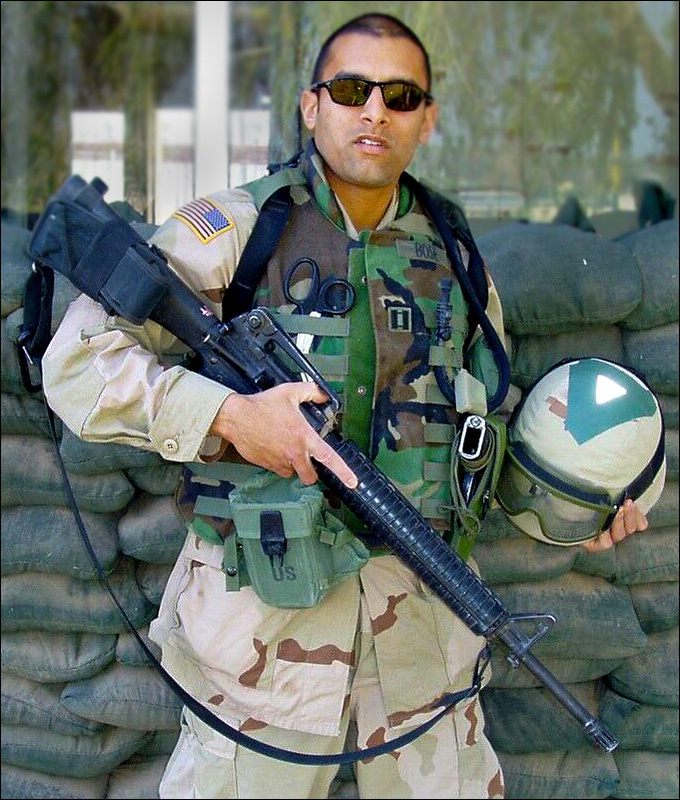 It was March 2, 2004 in Iraq – a day that was pivotal for me and really drove my mission in healthcare. I was in Bagdad; it was a hot day, and it was a religious holiday. It was Ashura, the most important holy day on the Shiite Muslim calendar. There were thousands of people marching on the road. They were the faithful, the hopeful, the committed – they’re marching on this religious holiday, and mingled in with that crowd were suicide bombers. They detonated themselves. All of a sudden, this peaceful, religious observance turned into a scene of complete chaos. Dr. Sudip Bose and his team work on an injured soldier in Iraq. Suddenly there were dozens and dozens of injured lying all over the place. Smoke and dust from the explosions drifted through the air. Screams rang out from all along the road. I was the only physician anywhere near the scene, somewhere around 800 meters away from the area of the detonations. Our team rushed into the middle of it all, and at that moment, immersed in the chaos, everything went into slow motion. I looked around, and I was wondering, how am I going to address all these patients? How am I going to get to everyone and see everyone and help everyone? It was an overwhelming thought. But in slow motion, in my mind, I saw our medics moving into action. They were functioning autonomously. They were tying tourniquets, they were starting airway devices, they were patching up holes in chests, and at that moment, I was very grateful that we had taken the time to train those medics. Because by training those medics, I had multiplied myself. One physician can’t reach all these patients, but by training the medics, I had multiplied myself and we were able to address those casualties. 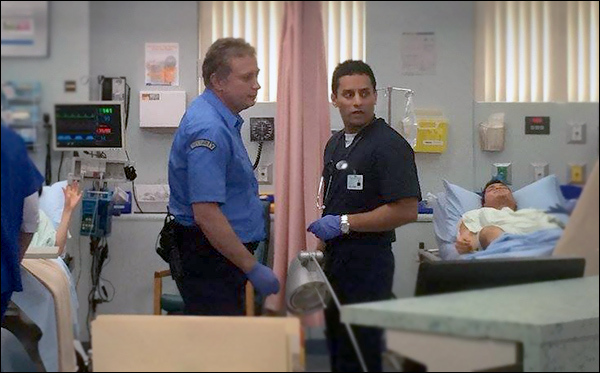 Dr. Sudip Bose (foreground, right) talks with a first-responder in the Emergency Department. You’ve likely heard the term “single-payer” used during the course of discussions of how to solve the problems America is having in ironing out a healthcare system that works for all the people. 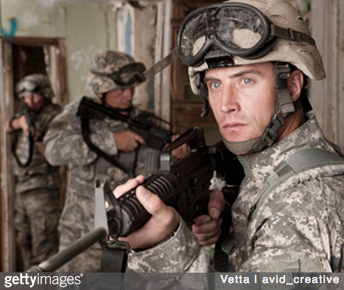 I’ve had some experience in a single-payer system of healthcare – the US military. I trained and worked in single-payer for over a decade when I was an Army doctor. I was both patient and provider. And I’ve got one thing to say about it: Don’t be disillusioned. Single-payer is not something that will solve all our healthcare concerns. It’s one option being discussed, but it’s not the golden ticket, if you will. Nothing is, actually. It certainly has its advantages, but there also are disadvantages that the American public may not like. There are good things and bad things about almost any healthcare proposal. It seems to me that in America, we’re at a crossroads of looking for the lesser of evils when it comes to healthcare. So let’s look at the good, the bad and the ugly as it relates to a single-payer system. Getting shot at tends to get you focused very quickly and very specifically on what you need to do to take control and eliminate the threat. I mean that literally; I learned that on the battlefields of Iraq. It’s the kind of thing that creates instant leadership. You figure out how to overcome the problem in front of you, or you very possibly will die. In the medical arena, when I was an intern, I faced my first “code” patient. “Code” is doctor talk for cardiopulmonary arrest – a heart stopping – in a patient in a hospital. When that happens, there are codes associated with each patient that determine the level of response by a medical code team – all the way from a full code, where every effort is made to resuscitate someone, to a limited code, to a “DNR,” or Do Not Resuscitate. A code team of medical professionals will rush to the patient and immediately begin appropriate medical treatment. On my first code response, I rushed into the room and froze. I didn’t really know what to do. And I remember the eyes on me, watching my inaction. I knew from that day on, that I needed to know what was going on. I learned that if I was going to be a leader, I had a need to learn what to do when I come face to face with a pulseless patient. Because when a patient codes, you need to take control, and you need to act quickly and decisively. You need to lead. I needed to learn fast, and I needed to continue to learn. At no other time on earth has the pace of change been so rapid. At no other time in history have leaders had to understand and process so much information to arrive at a decision. Also, at no other time have such diverse generations been in the work force – Baby Boomers, Generation Xers, Millenials – and they each have such a diverse work ethic and a divergent sense of reward. Surely by now many have seen the advertisement using “TV doctors” from the shows, “Grey’s Anatomy,” “Scrubs” and of course “M*A*S*H*” to encourage everyone to have their annual physicals: TV Docs of America. However, the president of the American College of Emergency Physicians (ACEP), Dr. Rebecca Parker, thinks that ad campaign was a waste of money. “The $9 million CIGNA spent on an ad starring well-loved actors playing physicians would have been better spent on patients,” she said. “Emergency physicians fight hard for their patients who are bearing an increasingly large share of the burden for their medical care,” she added. And therein lies the issue — increasingly patients find themselves caught between their health plans and their physicians. Emergency department (ED) physicians countered with their own video of real ED physicians as a parody of the CIGNA ad that included yours truly: ER Doctors of America – Parody of Cigna Health Insurance Ad (that’s me in the light-blue scrubs). Twenty-plus years ago (when many of those TV doctors were in grammar school) the traditional employer-sponsored health plan was an “80/20” PPO plan (Preferred Provider Organization) where the health plan reimbursed 80 percent of the allowed physician charge and the patient reimbursed 20 percent (co-insurance) after his/her deductible. Unlike today, deductibles back then were perhaps as high as several hundred dollars but rarely in the thousands. Today the average individual deductible exceeds $1,400 according the Kaiser Family Foundation (KFF) and rose double digits just last year (see chart below). The patient has become the largest non-governmental payor in healthcare. Today what the average patient spends on deductibles (which is what a patient pays before their health insurance coverage kicks in), co-insurance and co-pays (patient cost sharing) is less than the average deductible, so the average patient is “underwater” even before insurance kicks in. While the ACA (the Affordable Care Act, also known as Obamacare) did not create “high deductible health plans” (HDHPs), it certainly accelerated their growth and use among the millions who purchased the benchmark ACA Silver Plans. At above 250 percent of federal poverty level (FPL), folks who purchased Silver Plans have limited first-dollar coverage for preventative care and immunizations but faced HDHP features that many who obtained employer-sponsored coverage have experienced for many years. The net result of these trends and legislation meant that the patient became the largest non-governmental payor in healthcare — and many have experienced the “surprise coverage gaps” that were unheard of 20-plus years ago. In 1986, Congress passed the “Emergency Medical Treatment Active Labor Act” or EMTALA, and as a result, the greatest unfunded mandate in healthcare in American history was launched. EMTALA mandated that every person who presented him or herself to an emergency department was entitled to a “medical screening exam” (MSE) and stabilizing care for an emergency. Hospitals are required to have specialty physicians “on call” – e.g. orthopedics, neurology, cardiology, surgery, etc. – so the MSE and stabilizing care could be completed. So health plans knew then and today that their members will not be turned away from the ED regardless of their insurance, deductibles or cost-sharing levels. In 1997, Congress also enacted the “prudent lay person” amendments to the Balanced Budget Act of 1997 (BBA ’97) which required Medicare and Medicaid managed care plans to permit a person’s access to the ED if he/she believed, as “a prudent lay person”, that he/she was having an emergency including suffering from severe pain. BBA ’97 was essential, as prior to that law health plans were requiring that patients call and receive “prior authorization” for ED visits or the plan would retrospectively deny the ED visit for reimbursement. So while access (EMTALA) and treatment (BBA ’97) were guaranteed by federal law more than 20 years ago— unfortunately reimbursement for those mandated services was not itself mandated. Surprise coverage gaps occur when an ED patient reasonably believes that they are having an emergency, are treated by the ED and then discover after the fact that their health plan does not provide fair coverage for the services that were provided to them or their family member. One common coverage gap is that the patient’s health plan will reimburse the physician at or about Medicare levels—leaving a large “balance”, or difference, between that “allowable charge or rate” and the clinician’s charges or the “balance bill”, particularly where the clinicians were “out of network” (OON), which of course the patient has no control over. The Medicare fee schedule is a creature of federal law and regulations and restricted by those laws in providing for fair coverage for services. In fact, comparing Medicare payments to inflation from 1992 to 2016, Medicare reimbursements have decreased over 50 percent. A non-profit Rand Study in 2016 found that nearly one-third of New Jersey hospitals would have net operating losses if reimbursement rates were at or near Medicare levels. So at a time when non-profit health plan executives are reaping millions in compensation—the top 10 executives at Health Care Service Corp. (owner of BCBS plans in Illinois, Montana, New Mexico, Oklahoma and Texas) split approximately $58 million in 2015 (see: Modern Healthcare Sept. 26, 2016) —they put profits above patients and stuck the patients in the middle of potential disputes with their physicians. In 2015, ACEP and EDPMA formed a Joint Task Force (JTF) to develop strategies, white papers and documents to assist their members in addressing their state-level legislative issues. Based on the JTF’s 2016 Strategies White Paper, ACEP and ASA then wrote common principles and proposed solutions (some of which can be found here: ACEP Outlines Top Priorities for Replacing ACA), and now nearly 10 national medical societies have adopted their common sense solutions. An AMA resolution was pending for their June 2017 meeting. A new non-profit, multi-specialty advocacy organization was born in 2016, Physicians for Fair Coverage, Ltd. (PFC). 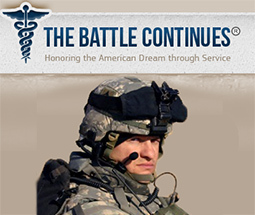 “The PFC immediately went to work to build on the ACEP/EDPMA JTF work and to write “model legislation” as the OON legislation issues were cropping up in nearly 15-20 states,” said Ed Gaines, an attorney with Zotec Partners, LLC, a large physician revenue cycle management company. Gaines also is chair of the ACEP/EDPMA JTF and serves as model legislation chair for PFC. “ACEP’s survey from February 2017 showed that 95 percent of patients want health plans to cover ED care, so we need to find a fair coverage, patient-centric and transparent solution to these issues,” Gaines said. As a working ED physician, we see every day that there is a “cost/quality” equation playing out in our hospital EDs — and increasingly the unfunded mandates of well-intended laws from over 30 years ago are bringing the healthcare safety net to the breaking point. “Frequently ED physicians ask me why the health plans seem to be targeting them when the ED is approximately only two percent of the US healthcare expenditures — and I shrug and tell them, ‘because they can and they know their members will be treated by you regardless of their insurance,’ ” Gaines said. “It’s patently unfair for the plans to do this but the ‘House of Medicine’ is together now like never before and we will successfully advocate for fair coverage for the nation’s patients,” he said. What’s happening is that patients don’t realize just how much healthcare costs are being shifted to them because they generally focus on premiums and either don’t recognize or sometimes even actively ignore these copays and deductibles thinking they’ll be healthy all year and won’t have to worry about those costs. It’s not just Emergency Departments that are struggling with out of balance costs – it’s the patients across the entire spectrum of health care who are now struggling to shoulder the burden of the costs. Patients readily recognize premiums – the amount they have to pay each month for their healthcare coverage – and largely, they haven’t really felt a pinch there because premiums have risen slowly over the past 10 years. What people often don’t pay that close attention to, however, are the other two legs of costs associated with healthcare – copays and deductibles[DSB1] . A copay is the percentage a patient pays each time he or she sees a doctor. The deductible is how much a patient has to pay before the insurance kicks in. What’s happening is that patients don’t realize just how much healthcare costs are being shifted to them because they generally focus on premiums and either don’t recognize or sometimes even actively ignore these copays and deductibles thinking they’ll be healthy all year and won’t have to worry about those costs. What we’re seeing now is that an average patient’s healthcare spend is less than the average deductible. The patient is becoming the largest payor in health care because they’re paying for everything and not reaching their maximum deductible. So patients need to pay attention to all costs – premiums, copays and deductibles, and not just premiums alone. Basically patients have become self-insured except in cases of major hospitalization. That’s something that most don’t realize. Companies sell high-deductible plans and people don’t realize they don’t really have coverage – they’ve got a relatively major up-front cost to pay before their insurance kicks in. In other words, most people with ACA plans are in the same boat, having such a high deductibles that they are essentially self-insured, because they’ll be spending all their own money for healthcare coverage and will not see any money come their way in terms of compensation or reimbursement from their insurance plan. By comparison, workers’ wages increased 1.9 percent between April 2014 and April 2015, according to federal data analyzed by the report’s authors. Consumer prices declined 0.2 percent. 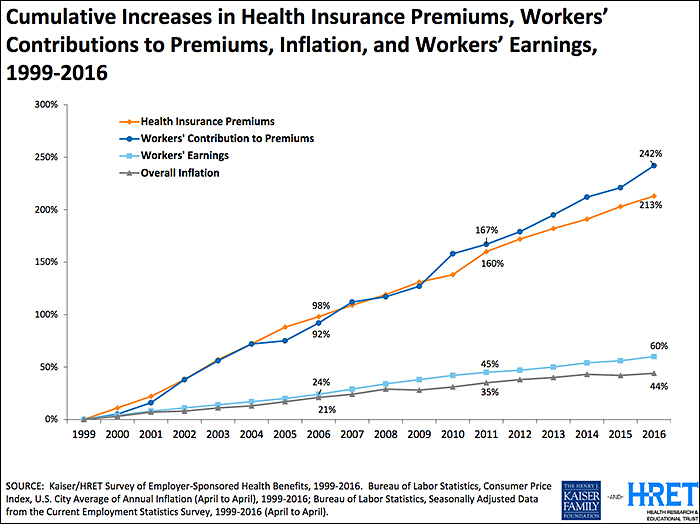 ‘We’re seeing premiums rising at historically slow rates, which helps workers and employers alike, but it’s made possible in part by the more rapid rise in the deductibles workers must pay,” Drew Altman, CEO of Kaiser was quoted as saying. What that means is that for the first time in our nation’s history, patients have become the primary payor for their medical costs. Unfortunately that’s not an exaggeration. The cost of healthcare has been growing rapidly for decades. History shows that our modern healthcare system really saw its genesis back in 1929 and 1930 with the emergence of what eventually would became a well-known health insurance company, especially in the 1950s and 60s – Blue Cross-BlueShield. In 1929, Blue Cross started out as a partnership between Baylor University hospital and financially struggling patients. It was the year of the start of the Great Depression with the crash of Wall Street and families trying to figure out how to get through it all. Blue Cross began as a plan to allow patients to pre-pay 50 cents a month, which would allow a person 21 days of hospitalization a year. The plan proved so popular that it grew quickly – from about 1,300 in its early years to about three million in 10 years. In 1930, a group of physicians quickly adopted the Blue Cross idea when they saw the kind of success it was having and created Blue Shield, which developed a plan similar to the hospitalization plan of Blue Cross; but this partnership was between physicians and patients. Again, for a monthly fee, Blue Shield members gained access to physician services. This plan also proved extraordinarily popular. And note in the chart above how much the total medical cost per person per year (in 1982 dollars) jumped from 1965, when Medicare was enacted, to 1989 – from $593 per person to $1,920. As physicians, we want fair insurance coverage for all patients to bring costs under control and have manageable coverage. Right now, not only are the costs not manageable, they’re often not even known by the patient. Let’s say a patient comes through the ED and their costs are covered there, but then perhaps they get admitted to a surgical service and that assistant surgeon is out of network (OON), or a plastic surgeon comes in and sews up a laceration, and that plastic surgeon is not in network; the patient will get a “balance bill.” A balance bill is the difference between what the OON providers charge (let’s say that’s $1,000) and the amount reimbursed by the insurance carrier for that OON charge (let’s say that’s $450). So the patient’s left with having to pay $550, or the balance of the bill. The patients are then getting stuck with that bill, and that’s a problem. I’ll say it again: as physicians, we simply want fair insurance coverage for all patients. Insurance companies must provide fair coverage for their beneficiaries and be transparent about how they calculate payments. They need to pay reasonable charges, rather than setting arbitrary rates that don’t even cover the costs of care. Insurance companies are exploiting federal law [EMTALA] to reduce coverage for emergency care, knowing emergency departments have a federal mandate to care for all patients, regardless of their ability to pay. We all should be able to agree with that. And we all need to work together to get there. As I’ve written before, change has to focus on the center of the epicenter of healthcare — the doctor-patient relationship.